Romania's top defense body on Thursday approved a U.S. proposal to place anti-ballistic missile interceptors in the country as part of a revamped American missile shield, the president said. Romania will host "ground capabilities to intercept missiles" that will increase its national security and go into operation starting in 2015, President Traian Basescu said. "Romania will not host a system directed against Russia, but against other threats," Basescu said, adding that the measure was not directed against Russia. The U.S. State Department confirmed the plan. "Romania has agreed to host a Standard Missile 3 interceptor as part of the administration's new missile defense plan ... to protect U.S. forward-deployed troops and our NATO allies against current and emerging ballistic missile threats from Iran," State Department spokesman P.J. Crowley told reporters in Washington. Crowley also tried to assuage Russian fears, saying "as we have made clear over and over again, this is not a capability that is directed at Russia." U.S. Vice President Joseph Biden visited Romania in October as part of his tour of Central Europe, where he presented a revamped U.S. missile shield plan to replace a scrapped Bush-era plan to install interceptors in Poland and radar in the Czech Republic. Basescu said the old U.S. plan only protected a small part of Romania but the new one "guarantees full coverage of Romanian territory" in case of a hostile ballistic or mid-range missile attack. 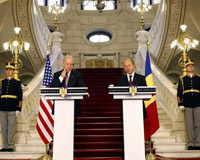 The decision by Romania's Supreme Defense Council came after a meeting between Basescu and U.S. Under Secretary of state for arms control Ellen Tauscher. Basescu said bilateral negotiations will start soon with the U.S. on this issue and the accord must be approved by parliament.